The orthodontic practice of Dr. Brad Edgren is not your everyday orthodontic office. Other orthodontists see crooked teeth and perhaps an occasional special case, but Dr. Edgren specializes in special cases. He has a master of Science in Temporomandibular Joint Disorders and Orthognathic Surgery and is a well-known author on clinical orthodontic topics. He treats crooked teeth too, but if there has been a diagnosis of a jaw disorder, Dr. Edgren is who you want to see. We’ll look at the basics of diagnostic methods and one common jaw disorders that Dr. Edgren sees. 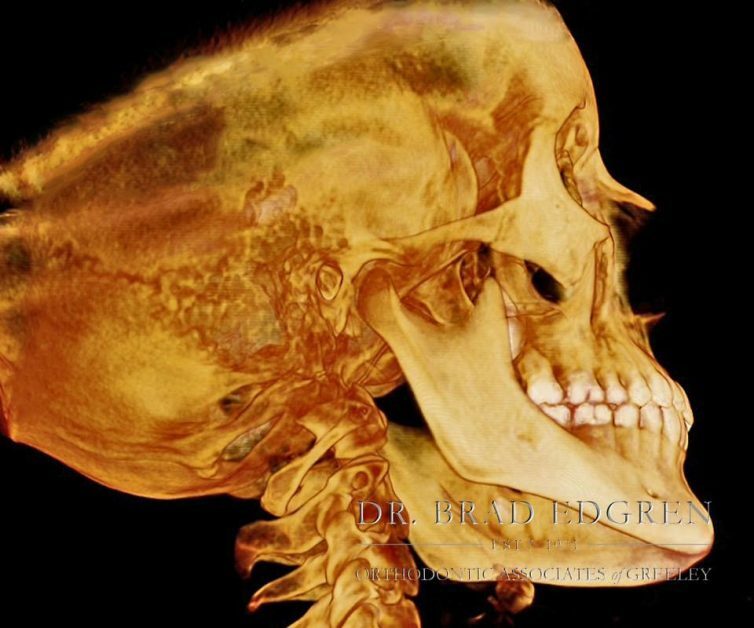 Instead of X-rays, Dr. Edgrens’ orthodontic practice uses 3D imaging. This type of imaging creates a full picture of the mouth, as opposed to the 2D image that is created by an X-ray where elements of the teeth and jaw can be laid over each other in the image, causing ambiguity. There is no room for ambiguity when a serious jaw disorder is suspected; the exact location of all anatomic elements is essential to proper diagnosis. The depth that the 3D images give are important in treatment as well and this type of imaging has become an indispensable tool in advanced clinical orthodontics. 3D imaging is the standard of care that you can expect and matches the high standard of all other services you can expect to receive at Dr. Edgren’s orthodontic practice. One diagnosis that can be made using 3D imaging is Temporomandibular Joint Disorder or TMJ. This joint is where your temporal bone on the side of your skull and your mandible, your lower jaw bone meet. When you open and close your jaw, and feel in front and below of your ear, you can feel this joint in motion. When this jaw works as it should, you won’t notice it at all as you speak, chew, yawn and sleep. The proper working of this joint is contingent on the proper placement and condition of a small disc of cartilage that separates these two bones. When this joint does not function properly it is often rooted in a disorder of this cartilage disc. It can be out of place or inflamed. The disc can be out of place or the muscles around this joint may spasm causing pain and a sore jaw. Arthritis and other diseases can also play a role. A jolting injury can also be the cause of TMJ. Listed below are some of the more common symptoms of temporomandibular dysfunction. Excruciating pain that radiates from the jaw into the side of the face, back teeth, the back of the head, and neck and shoulders. A jaw that gets stuck in one position, either open or shut. Clicking, popping and grinding noise when the jaw is opened and shut. Trouble chewing or a sudden, painful shift in how the teeth fit together. Headaches that are sometimes accompanied by dizziness, earaches, or ringing in the ear. If you are suffering symptoms that align with some or all of the symptoms above, call Dr. Brad Edgren to get a proper diagnosis. 3D imaging will most likely be sued to pinpoint the problem and then if a positive diagnosis has been made, treatment will begin. The first order of treatment is to calm the joint by resting it. This can be done by eating only soft foods, avoiding chewing gum, ice, and hot packs to soothe the joint, using over-the-counter pain medications and anti-inflammatory medicines. When you have severe pain in the jaw joint seek diagnosis and treatment with an expert. Call Dr. Brad Edgren for an appointment.